The former Iraqi leader, Saddam Hussein, has been hanged in northern Baghdad for crimes against humanity. Iraqi state TV showed images of Saddam Hussein going to the gallows before dawn in a building his intelligence services once used for executions. However the moment of his execution was not shown. 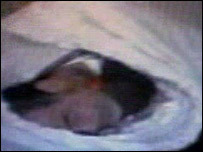 Pictures of his body wrapped in a shroud were later broadcast on TV. A representative of the prime minister and a Sunni Muslim cleric were among a group of Iraqis present. Saddam Hussein was sentenced to death by an Iraqi court on 5 November after a year-long trial over the killings of 148 Shias from the town of Dujail in the 1980s. "Justice, in the name of the people, has carried out the death sentence against the criminal Saddam, who faced his fate like all tyrants, frightened and terrified during a hard day which he did not expect," it read. A small group of Iraqis witnessed the execution in a spartan concrete-lined chamber at an Iraqi compound known by the Americans as Camp Justice in the suburb of Khadimiya. They watched as a judge read out the sentence to Saddam Hussein, 69. The former Iraqi leader was carrying a copy of the Koran and asked for it to be given to a friend. Footage broadcast later on Iraqi state TV showed a subdued Saddam Hussein being led to gallows by a group of masked men. He was dressed in a white shirt and dark overcoat, rather than prison garb. 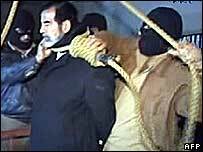 Saddam Hussein was led up onto the gallows platform and a dark piece of cloth placed around his neck, followed by the noose. When the hangman stepped forward to put the hood over his head, Saddam Hussein made it clear he wanted to die without it. The hanging itself was not broadcast. The execution procedure took just a few minutes. "We took him to the gallows and he was saying some few slogans. He was very, very, very, broken." Images of Saddam Hussein's body were also broadcast on Iraqi TV, still dressed in his overcoat and wrapped in a white sheet. His body is reported to have been flown by helicopter to an unknown location. Sources close to the Iraqi prime minister said the body would be buried in Iraq, but would not reveal where. Saddam Hussein's daughters Raghad and Rana had earlier asked that their father be buried temporarily in Yemen. According to their spokeswoman, Rasha Oudeh, the two women watched their father's final moments on TV. "They felt very proud as they saw their father facing his executioners so bravely, standing up," Ms Oudeh said. "They pray that his soul rests in peace." News of Saddam Hussein's execution was announced on state-run Iraqiya television, as patriotic music and images of national monuments were played out. It initially said his half-brother Barzan al-Tikriti and Iraq's former chief judge Awad Hamed al-Bandar were also hanged, but Mr Rubaie later said only Saddam Hussein was hanged. The others will be executed some time after the Eid festival ends next week, he said. Other Arab TV stations aired live footage of the sunrise over Baghdad's Firdous Square, where US Marines pulled down a statue of Saddam Hussein, after he was deposed in April 2003. There were jubilant scenes in the Baghdad Shia stronghold of Sadr City, with people dancing in the streets and sounding their car horns, and in the southern city of Basra. But in Saddam Hussein's hometown of Tikrit, where a curfew was imposed, the news sparked protests from supporters. Protests were also reported in Samarra and Ramadi. He said: "It is a testament to the Iraqi people's resolve to move forward after decades of oppression that, despite his terrible crimes against his own people, Saddam Hussein received a fair trial. "It is an important milestone on Iraq's course to becoming a democracy that can govern, sustain, and defend itself, and be an ally in the War on Terror." UK Foreign Secretary Margaret Beckett welcomed the fact that Saddam Hussein had been tried by an Iraqi court "for at least some of the appalling crimes he committed" and said "he has now been held to account". France called on Iraqis to "look towards the future and work towards reconciliation and national unity".